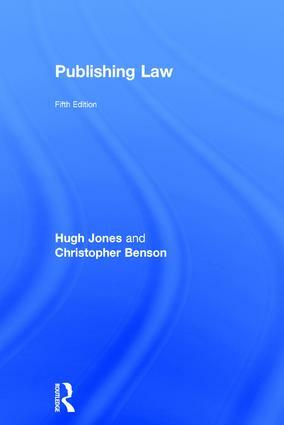 Publishing Law is an authoritative and engaging guide to a wide range of legal issues affecting publishing today. Hugh Jones and Christopher Benson present readers with clear and accessible guidance to the complex legal areas specific to the ever evolving world of contemporary publishing, including copyright, moral rights, contracts and licensing, privacy, confidentiality, defamation, infringement and trademarks, with analysis of legal issues relating to sales, advertising, marketing, distribution and competition. This new fifth edition presents updated coverage of the key principles of copyright , as well as new copyright exceptions, licensing and open access. There is also further in-depth coverage of the legal issues around the sale of digital content. useful appendices offering an A to Z glossary of legal terms and lists of useful address and further reading. Hugh Jones recently retired as Copyright Counsel to The Publishers Association. A qualified solicitor, he worked in publishing for fifteen years, for law publishers Sweet and Maxwell and reference publishers Macmillan Press, before practising for eight years as a publishing and copyright lawyer at City law firm Taylor Joynson Garrett (now Taylor Wessing). He writes and lectures regularly, and was for many years Treasurer of the British Copyright Council. Christopher Benson is a solicitor at City law firm Taylor Wessing. He has been practising for over 20 years as an intellectual property lawyer. He has considerable experience in the fields of publishing and copyright and also advises on all aspects of intellectual property law, both contentious and non-contentious, including copyright protection, trade mark protection and passing off, brand management, licensing, merchandising, sponsorship, franchising and advertising. He is a regular writer and lecturer on intellectual property matters.